Departments and agencies participating in the North Carolina Torch Run have numerous fundraising events throughout the year. These events range from golf tournaments, to motorcycle rides, to road races and vary with the community interest. A current list of events can also be found in the Torch Run Calendar. In addition to these uniquely local events, there are signature Torch Run events that generally work well in a majority of communities throughout the state. 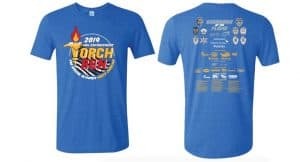 Contact Leslie Moyar for more information on Torch Run Events. 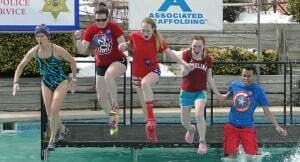 A Polar Plunge is a fun and unique event that involves a group of people jumping into a body of water in the middle of winter. The plungers raise money for the privilege of jumping into the water. A number of these events are held throughout the state on an annual basis. A list of plunges in North Carolina can be found at www.polarplungenc.com. View tips to maximize the fundraising for your Polar Plunge (PDF). A parking lot plunge is the same as the traditional Polar Plunge, but it takes place in a swimming pool set up in a parking lot or other similar location. Five-person teams compete to see who can pull a jet 25 feet the fastest. Visit ncplanepull.com for more information on this event. Work up a sweat for Special Olympics North Carolina at the “WOD for INCLUSION” fundraising event! The workout “1968” was created to honor Special Olympics athletes worldwide. This event is for anyone and everyone who’s up for a challenging workout for a great cause. Get more information here. Truck Convoy for Special Olympics features local law enforcement officers escorting a convoy of trucks through the area to raise awareness and funds. The truckers pay an entry fee to participate and also raise additional funds for the privilege of being the lead truck or the last truck. Participants raise a minimum of $1,000 for the opportunity to rappel 30 stories down the Wells Fargo Capitol Center in Downtown Raleigh. Get a view of the city few ever will and raise your support of Special Olympics athletes to new heights! Registration and more information at overtheedgenc.com. Officers sit on top of a building in a high traffic location such as a Walmart or a fast food restaurant — like Chick-fil-A — and draw people to the area while other volunteers solicit funds from patrons. A document that provides best practices and detailed timelines for the event are available for download as a PDF. A Tip-a-Cop event is a great was for law enforcement officers to get into the community and be able to interact with the public in a one-on-one setting. Law Enforcement officers partner with the traditional waitstaff to serve as “celebrity” wait staff and help with duties such as refilling drinks and bringing out bread while talking to the customers about Special Olympics and the Torch Run. At the end of the meal, law enforcement officers ask for a donations for Special Olympics in addition to any tip that would normally be left for the wait staff. annually. Please contact SONC staff who can direct you to agencies with successful golf tournaments. The key to a profitable golf tournament is having green fees and food/beverage sponsors. Make sure your expenses are at no more than 25% of your event revenue. Run WITH the Law involves middle and high school students along with local law enforcement coordinated by the School Resource Officer. Participants raise funds in order to run with law enforcement officers and the “Flame of Hope.” Additional information and a timeline for Run WITH the Law as well as the Run WITH the Law Participation Waiver are now available. T-shirt sales generate approximate 10% of the $1 million raised annually by the Torch Run in NC. Each year a unique T-shirt design is sold statewide by Law Enforcement Officers. The minimum donation for a cotton t-shirt is $15. The minimum donation for a technical running shirt — 100% polyester shirt that wicks away the sweat — is $20. Polar plunge towels are also on sale for a minimum donation of $20. Many departments will set up a table in a high traffic location such as a community event/festival or in a popular shopping center to solicit donations for the high quality shirts or hats.